M&E Painting is more than a painting company. We are a team of individuals who exist to enhance our community by inspiring leaders to impact lives. This may seem like a strange mission for a group of people working at a painting company, but we see painting as a way to inspire and serve others in the community. 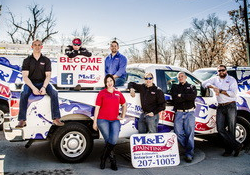 Our team is comprised of the highest caliber individuals who are always striving to improve themselves and M&E Painting. The ideal candidate for any of our available positions enjoys and constantly pursues personal growth which will ultimately lead to M&E Painting growing. Below are the available positions.